Announcing the 2017 Award Winners! 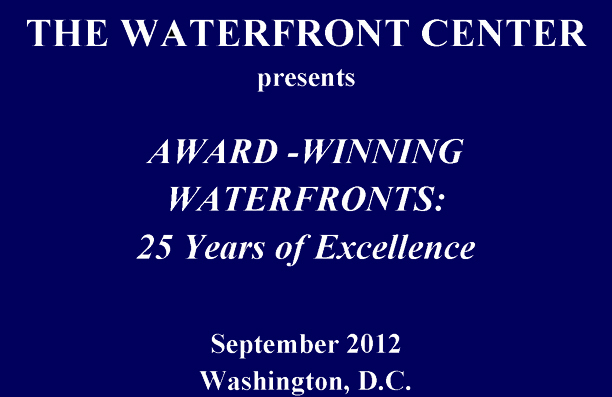 The Waterfront Center is pleased to announce the winners of the 30th Annual Excellence on the Waterfront Awards program. As usual there is a range of geography and type of project. We are looking forward to an exciting awards ceremony and program at the Churchill Hotel in Washington, D.C. Visit HERE for more information and sign-up forms. 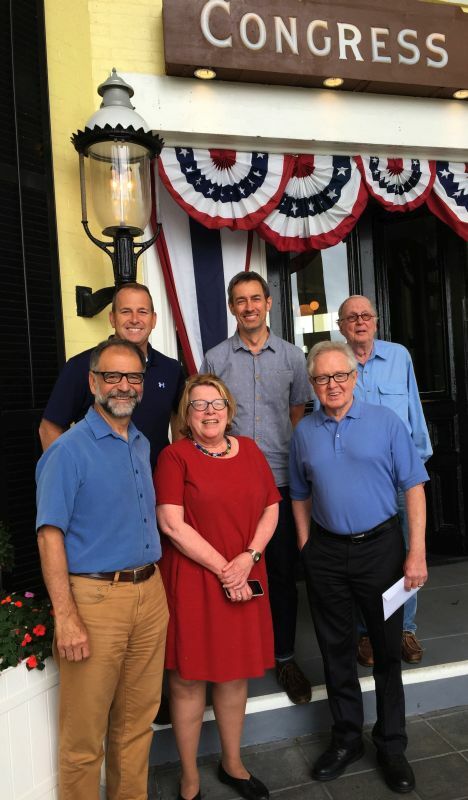 CAPE MAY, New Jersey – The 2017 ‘EXCELLENCE ON THE WATERFRONT’ awards program, organized by the non-profit Waterfront Center of Washington, District of Columbia., for the past 30 years, recognized seven built projects and two plans. The jury, led by Bill Wenk of Wenk Associates, Denver, Colorado, met for a day-and-a-half at Congress Hall in this seaside resort. Winners will be recognized at an Awards Ceremony on September 8 in Washington, District of Columbia, followed by a reception and dinner. Each entrant will be given 20 minutes to describe their entry, usually with a power point illustration. • Big River Crossing, submitted by Friends of Our River, Memphis, Tennessee. Entrant: Charles McVean, McVean Trading and Investments LLC, and co-entrant, Harry Pratt, Allen & Hosall, both Memphis. Owner/developer Robert Knecht, City of Memphis, and Paul Luker, Crittenden County, Arkansas. Honor Awards/Projects in alphabetical order. • Infra-Space 1, Boston, Massachusetts. Submitted by Dan Adams and Marie Law Adams, Landing Studio, Somerville, Massachusetts., and Robin Blatt-Eisengart, Massachusetts Department of Transportation, Boston. • Light City, Baltimore, Maryland. Submitted by Ashley Molese, Baltimore Office of Promotion and the Arts, and Bill Cole, Baltimore Development Corporation, both Baltimore. • Old Mill District, Bend, Oregon. Submitted by Bill Smith, Old Mill District, Bend, and Carol Mayer-Reed, Mayer-Reed Inc., Portland, both Oregon. • Point State Park, Pittsburgh, Pennsylvania. Submitted by Marion Pressley, Pressley Associates Inc., Boston, Massachusetts, and John P. Jaskolka, Department of Conservation and Natural Resources, Prospect, Pennsylvania. • Principal Riverwalk Pavilion, Des Moines, Iowa. Submitted by Paul Mankins, substancearchitecture (cq), and Pam Cooksey, City of Des Moines Engineering Department, both Des Moines, Iowa. • Phyllis J. Tilley Memorial Bridge, Fort Worth, Texas, Submitted by Miguel Rosales, Rosales + Partners, Boston, Massachusetts., and Stacey Pierce, Streams and Valleys, Fort Worth, Texas. • Tar River Legacy Plan, Greenville. North Carolina. Submitted by Ron Sessoms, Rhodeside & Harwell, Alexandria, Lamarco Morrison, City of Greenville Recreation and Parks, Greenville, North Carolina. • Bill Wenk, principal, Wenk Associates, Denver, Colorado. • Thomas Corcoran, president (retired), Delaware River Waterfront Corporation, Philadelphia, Pennsylvania. • Michael Zaleski, president and CEO, Riverfront Recapture Inc., Hartford, Connecticut. 1914 Connecticut Ave. NW, Washington, D.C.
Friday afternoon attendees at the mini-conference will hear presentations by the 2017 award winners. The winners will be announced on the Center’s web site in August and the list of speakers posted. They will receive their awards and be feted at a champagne reception at 6:00 p.m. Bill Wenk, Wenk Associates, Denver, Colorado, this year’s jury chair, will preside. Fee will include conference attendance and the reception. 2101 Connecticut Avenue NW, Washington, D.C. The Optional Gala Dinner, always a convivial evening will include a delicious multi-course meal with wine and champagne toasts. A small block of rooms has been reserved at the hotel. 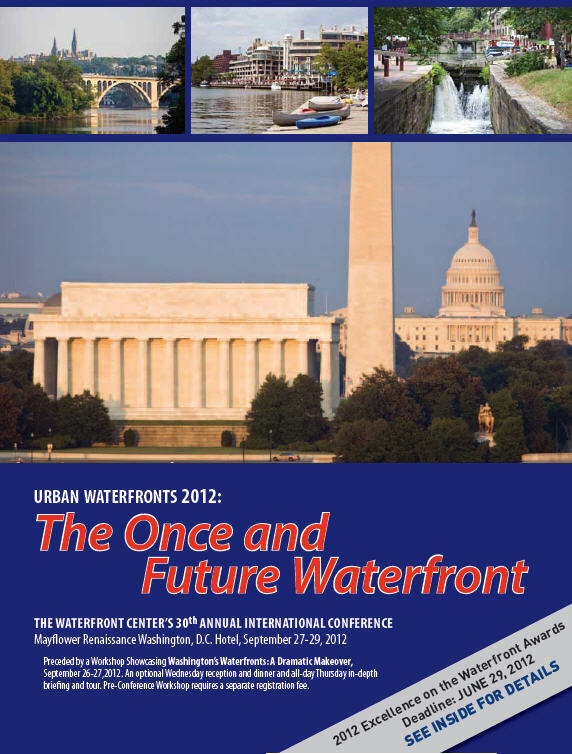 Call 202/797 2000 and ask for The Waterfront Center room rate of $165.76. The Waterfront Center, Washington, D.C.
Chris Carlson and Steve Durrant, Seattle, Washington. Alvin and Harriet Saperstein, Detroit, Michigan. Yuma Crossing National Heritage Area, Yuma, Arizona. We are working full speed ahead with our colleagues in Yuma to put together a dynamite Urban Waterfront 2018, the 33rd gathering of those involved in waterfront work. A printed brochure will be mailed in early September and more detailed information will be posted on both the Waterfront Center's and Yuma Crossing National Heritage Area's web sites soon thereafter. 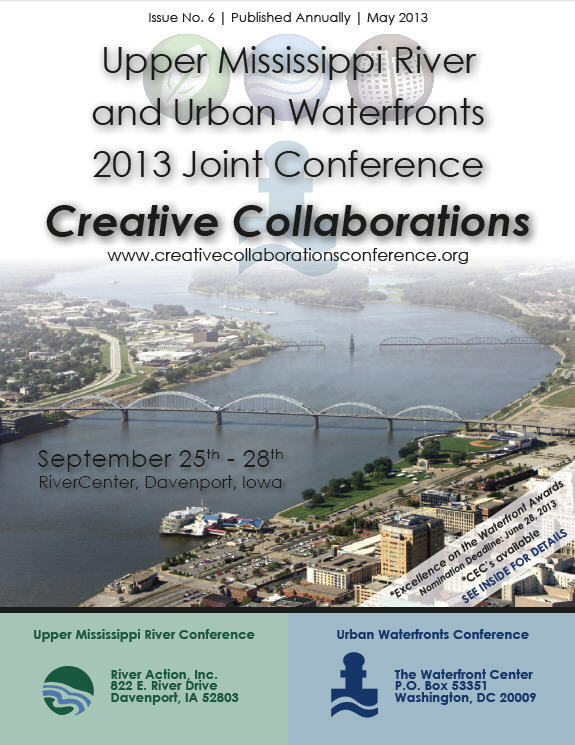 American Institute of Architects/Communities by Design, Washington, D.C.
Sept. 25 to 28, 2013, River Center, Davenport, Iowa. For information on Conference Support Opportunities and Benefits contact The Center at 202/337-0356 click on Sponsorship Opportunities above. Please help us to make future conferences a success. The Waterfront Center Urban Waterfronts 2012 – its 30th annual international conference -- was a singular inspirational event bringing together over 25 top planners, designers, developers and civic decision makers to share their experiences and thoughts on the past quarter century in interactive sessions facilitated by provocative and knowledgeable moderators. The attendees were, as with past 29 Center conferences, given a chance to network with an interdisciplinary community from all over the world with a shared passion and concern for waterfronts to reflect with each other on where the movement has been and where it is poised to go. 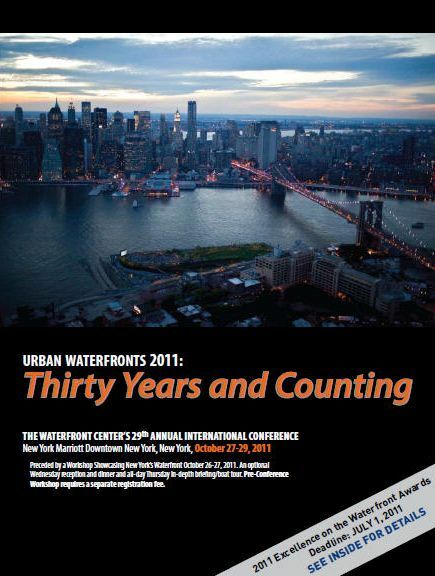 “THIRTY YEARS AND COUNTING” was the theme of this year’s Waterfront Center conference held in New York City in October. 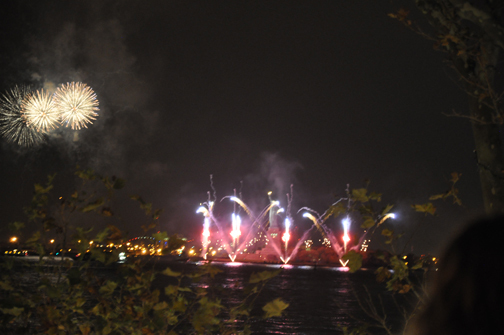 This is in recognition of the Center’s 30th anniversary in 2011 as well as the approximate date when the waterfront redevelopment phenomenon took hold in this country and abroad. 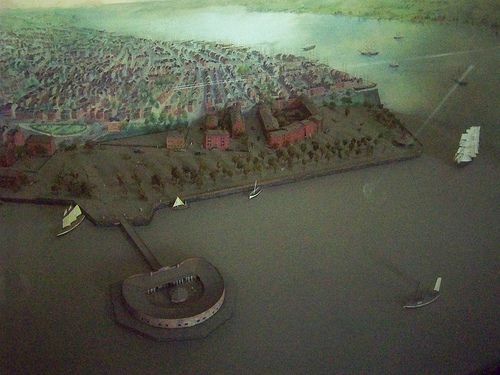 To reflect the theme, one of the conference’s 12 panels featured cities whose waterfront work dates back at least 30 years. Candidates include London and Liverpool UK, Newport, R.I., Oakland, Calif., Seattle, Wash. and St. Louis, Mo. 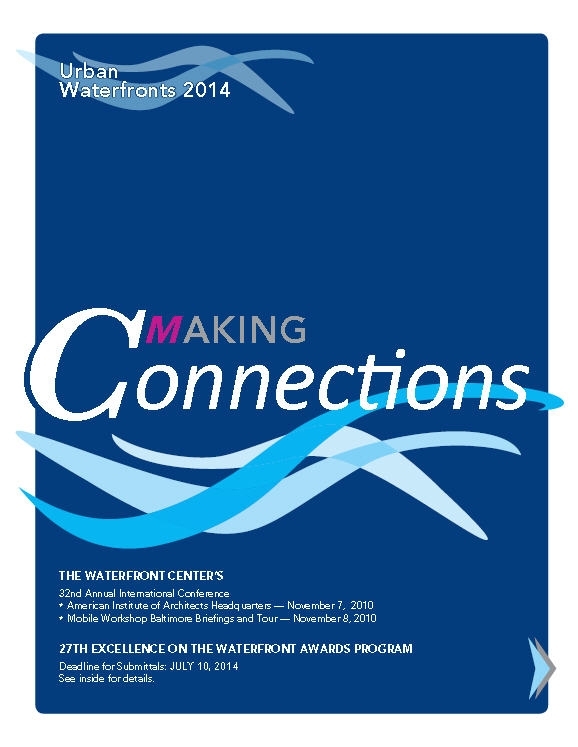 For over 25 years the Center’s conference has been recognized as the premier international waterfront meeting, bringing together a wide range of practitioners from varied disciplines and geography. 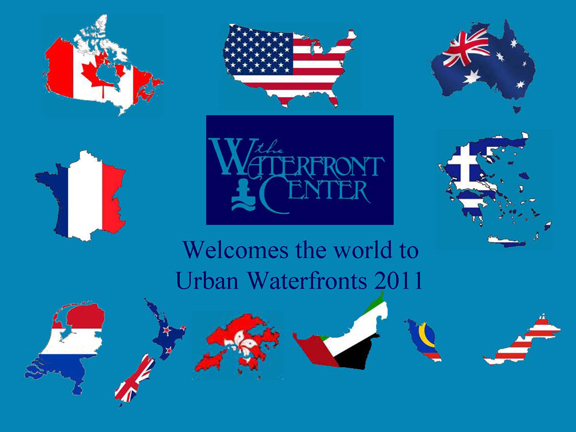 In all the Urban Waterfronts 2011 featured 33 presenters, from cities of all sizes and from a range of geography including overseas. In addition there was a keynote feature and a closing presentation. A conference highlight was the first announcement of the winners of the Center’s annual awards program. 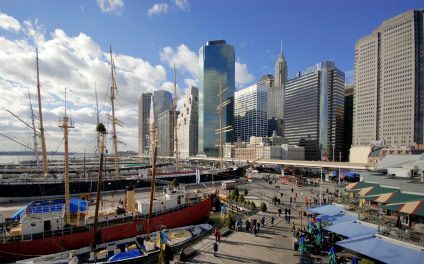 The 2001 jury chairman was Jonathan Goldstick, senior vice president, Halcrow Inc., New York, N.Y.
A pre-conference workshop featured a sampling of the New York area’s waterfront projects was conducted all day on Thursday, Oct. 27. 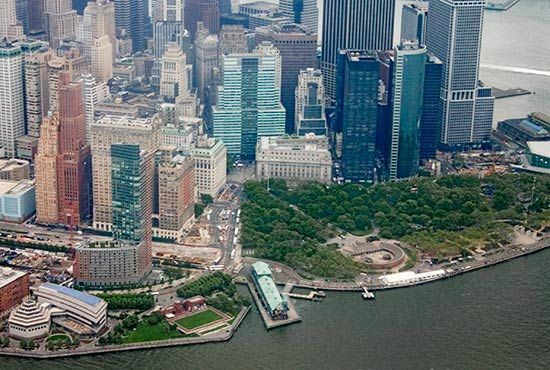 Special briefings and on-site tours were organized by a host local committee, headed by Donna Walcavage, principal/vice president at AECOM and Roland Lewis, president and CEO, Metropolitan Waterfront Alliance, both New York City.